Yay we are already on to tasting number two of the new year. If you hadn’t gotten a chance to read about our first tasting, check it out right here. 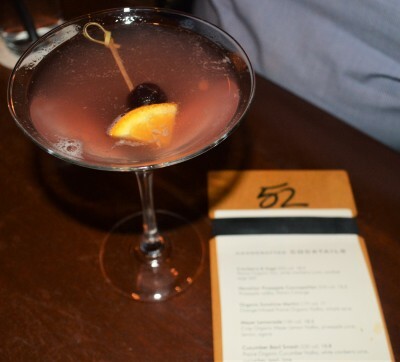 Our newest tasting took place at Season’s 52 and on a FRIDAY. Let’s just say we really appreciate them accommodating us on such a busy night. By now you guys should already know who’s dining with me. The other half of the Dynamic Duo, Rochelle Wharton of Culinary Vegg Out & Lifestyle. We also brought along a guest. Let me introduce to you Shana of the blog, Technotini. It was a pleasure having her join us. Now onto our scheduled tasting. We knew it would be a little rough doing a tasting on a Friday night. Everyone had been locked away earlier in the week due to the snow and ice that took over our city of Atlanta. That Friday would be the first night everyone was able to safely take to the street. I feel like a good portion of them ended up at Season’s 52. Even with all the added people, the staff was pleasant and welcoming. Once seated we got to meet our server for the night, Brittany. She was awesome, fun-loving, and knowledgeable. We started our dinner off with . . . you guessed it cocktails! I know you thought I was going to say appetizers. We ordered appetizers as well, but first, cocktails. I had the the Hawaiian Cosmos, Shana the Basil Smash and Rochelle had the New Old Fashion. Can I tell you that I think that this is my new favorite cocktail? I knew that i would return here, if for nothing else, for this drink. Our appetizer selections started with the Roasted Roma Tomato Flat Bread. Great for those looking for a vegetarian appetizer. Their menu carries a few things that are vegetarian friendly. We also ordered the Buffalo, Spinach & Brussel Sprouts dip that came with Sesame Crackers. I loved the concept of the dish, but the gorgonzola cheese over-powered the taste of everything else in it. Our final appetizer was the Stuffed Mushroom – filled with lump crab meat, roasted shrimp and spinach. I liked it for those possibly looking for a pescatarian option. We had so many options for our entree choices, either something from the”Sea” or the “Pasture”. It took a minute to arrive at our decisions. Rochelle chose the Boneless Grilled Rainbow Trout with Crushed Potatoes and Heritage Carrots and a side of Roasted Brussels Sprouts (minus the applewood bacon). The trout was moist and tasty; not dry which can easily happen when being grilled. Having brussels sprouts prepared with the balsamic glaze gave me a new preparation idea I could add to my arsenal. Shana had the Caramelized Scallops with Butternut Risotto, Broccolini and Lemon Butter. I enjoyed the smokiness they achieved with grilling the scallops and the risotto wasn’t too al dente which I greatly appreciated. The risotto made me think about Chef Ramsey’s show “Hell’s Kitchen”. I wondered if anyone was sent home from the kitchen for not getting it right before this properly executed dish was presented to our table. Go figure the things that go through my mind sometimes, LOL! I decided to order the Boneless Short Rib with Stone Ground Grits and Heritage Carrots. The beef was so tender and the grits ever so tasty. I didn’t even attempt to finish my entree because I knew that dessert was next. I wanted to be able to sample something, even if I had to box it up to finish the next day with a cup of tea. JUST before dessert we got to meet Austin, one of the bartender’s that works at the Buckhead location of Season’s 52. He was a wealth of knowledge, not just about drinks, but food and drink pairings, and some of the ins and outs of Season’s 52. He arrived at our table not empty handed, but came with cocktails for us to sample. I had a wonderful video of him pouring and schooling us about the drinks but my smartphone sent them along with my pictures to some unknown place (please know that I am still getting over this). All the pictures seen here are courtesy of Rochelle, solidifying that it’s a good thing to have a blogging partner. They come in handy during times like these. Brittany, our server, arrived at the table with the perfect dessert for us. It was an assortment of dessert shooters with something for everyone. There was key lime, pecan pie, chocolate s’more, mocha macchiato, chocolate peanut butter torte and carrot cake shooters. I mean if we couldn’t find something we liked something was definitely wrong with us. Unanimously the pecan pie won prizes with us. The mocha macchiato and the chocolate s’more (minus the meringue) followed for me. The best thing about their desserts is their size. You can never over do it because it comes as a shooter . . . unless you order more than one. My time at Season’s 52 was good. Being able to hang with a new blogger added to my memories. When you get a chance hit Season’s 52 up and let me know what you had and how you liked it. Now go forward and make memories. What better way to start the New Year off than with a tasting? I mean it is only fitting that I would greet you guys with a new place to check out. I know everyone else is running around making New Year resolutions and stuff but let’s be honest. For most that list may have lasted a week, if that long. Me? I am a goal setter. So one of the goals I have set is to have more tastings, so that I may share them with you. Give you new places to go visit and make new memories. With that being said the latest tasting comes to us courtesy of Caren West PR and The Room at Twelve. With the temperature drop that happened the day of our tasting, I was more than happy to leave Petty Betty with valet. God bless valet parking! With a short walk from my car to the lobby of Twelve, I met Rochelle at the bar. Dan Whitaker, the manager of Room, offered us cocktails to start our evening off. He suggested a cosmo for me since I like vodka with a little bit of sweet. Great choice! After a few sips and a little bit of chatting on our part, Dan whisked us off to our table. Once seated we met our server for the night, Taylor. He was fun and full of suggestions. We started our meal off with appetizers: a crab cake, acompanies by a very lovely cucumber and tomato salad, as well as fried calamari with sambal syrup and wasabi aioli. The crab cake was tasty and I loved the presentation. However, I felt like the crab meat was broken up too much and didn’t get a chance to show off the nice lumps of crab I was looking for. The calamari was perfectly cooked. We all know what overcooked calamari is like, nothing worse than seafood bubblegum. Even though the calamari was perfectly cooked, I was a little taken aback by how sweet the sambal syrup made the dish. I was expecting it to be spicy with a hint of sweet, but it cancelled out some of the spicy I had been anticipating. Other than that I thought the appetizers were very much on point. For our entrees Rochelle had the Pan Fried Georgia Trout served with Cranberry & Apricot Couscous and Asparagus. Her fish was spiced with tumeric and had a nice crisp to it with a moist flaky inside. The simplicity of the fish paired so well with the couscous that a little more going on. I loved how the flavors of the butter and garlic stood out and was soften by the sweet of the dried fruit. I would order that the next time around. For my entree I ordered the Grilled Lamb with Garlic Mashed Potatoes and Asparagus. My lamb was very tender and tasty, the chef paired a sauce that helped with the gameness often associated with lamb. Although Rochelle isn’t one for a sweet sauce, I thought it worked great with my meal. It even made the garlic mashed potatoes shine a little more along with the asparagus. Overall I’d recommend the lamb to anyone to try. What meal would be complete without dessert? Chef Huerta out did himself with his presentation of our desserts. I almost didn’t want to eat my dessert. Almost. Believe you me I did eat dessert. I mean I ate what I could and boxed the rest up to enjoy the next day. Rochelle had the Apple Crumb Cake, which came out warm and moist. I wish the whole cake could have been the edge because that’s where the happiness lived in this dessert. It was nice and buttery and left you wanting more. Now, anyone that knows me knows I love a good chocolate cake. Hell I have a Pinterest board dedicated just to chocolate cake. A little obsessive? Maybe but when you love a thing you just love a thing. So I had to order the Flourless Chocolate Cake. I have had flourless chocolate cakes before that were too eggy and not enough chocolate. This cake, on the other hand, was neither. It was light with layers of cake and ganache sandwiched perfectly together. It was served with vanilla ice cream which made me dance in my seat a little. Both desserts were winners all around. Neither dessert was too sweet and the plating made you want to eat it even more. If you don’t believe me, the pictures will speak for themselves. My time at Room at Twelve was very memorable. And you guys know how I feel about making good memories. When you are in the metro Atlanta area, make sure you check out Room. It’s a great place for memory making. Now get off my blog to go forward and make memories. P.S. The interior of this restaurant is very hip an chic but my favorite room they have is the fish bowl. It seats up to 14 people and can be reserved with a call. It has an all glass wall with windows with a view of the busy Atlanta cityscape. If you plan to have a large group ask for this room, trust me you won’t be disappointed. Okay Christmas is out of the way. Now to focus on the the start of the New Year – 2018. Hold on, we have a whole week, actually less than 7 days until the new year. 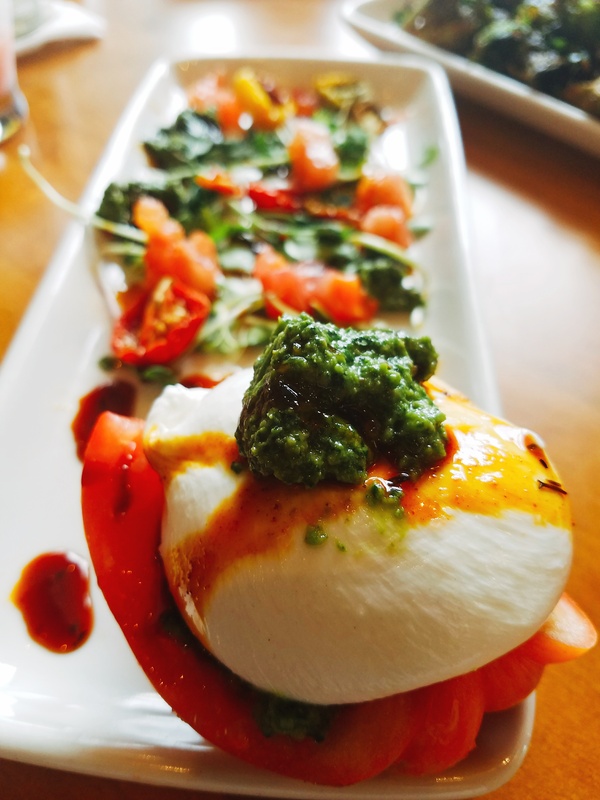 Why not put those days to use by trying out one of my fave five restaurants in the Atlanta area? Eating at one of these five restaurants will give you a chance to connect with family and/or friends you may not have seen for Christmas. It’s holiday magic waiting to happen! Good eats with good folks is sure to equal good times. Bar Margot – located in the Four Seasons Hotel on 14th Street. From the moment you arrive it is impeccable service. The valets are gracious and everyone you meet as you move to your seat is divine. It only gets better the longer you stay. 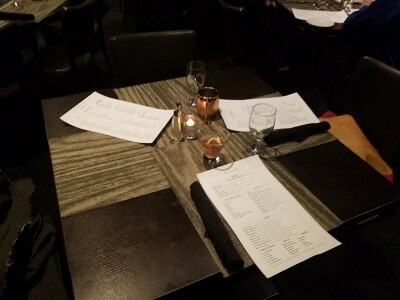 The food is great and the staff extremely knowledgeable. If you think I’m joking try them. They can suggest substitutions on so many things, if there is something you may not eat or isn’t a part of your dietary needs. And as luck would have it, they are hosting a New Year’s Eve celebration. Click the link to find out more about it www.BarMargotAtl.com Hey make sure you try the huckleberry cheesecake while there. And tell the executive pastry chef, LaSheeda Perry, I sent you over. I hope you decide to use the last few days of 12017 as a time to create some wonderful memories. It is the one thing I have always encouraged you to do throughout the year. I plan to visit more restaurants and share my experiences on them in the coming New Year. Together with sharing my life as the Chef in Pearls, I look forward to 2018 and the new memories it will bring. As always, go forth and continue to make new memories. ~ The Chef In Pearls. Cannot access this app. That’s what my phone notified me of when I tried to visit my picture gallery. I needed to delete some stuff in order to continue on my merry picture ways. That’s when I realized I had some forgotten files I had not shared of a few other places I visited last month. I may have forgotten to share the pics but the places made a mark on me. The first place being Kefenio. It’s this wonderful Greek cafe located in College Park. A couple of months prior I helped with an event and Kefenio was what we had for lunch. So when I got back to College Park, I had to make it to the restaurant. It was well worth the visit. I was even lucky enough to meet the Chef and owner, John. I decided on the lamb burger, which was moist and flavorful, with their french fries that came seasoned with garlic, oregano and salt. YUM. Make sure to get a side of tzatziki sauce to eat your fries with, well worth the extra cents. It will make you dance in your seat as you eat the fries. I promise, scouts honor. While still scrolling through my pics I came across another one of my forgotten files I visited. Have you heard of Shake Shack? Well I have. It’s supposed to be a “Hip, counter-serve chain for gourmet takes on fast-food classics like burgers & frozen custard”. So you know I was super stocked when the YP Insiders got an opportunity to visit and dine at its location here in Georgia? It’s located in the Shops of Buckhead, Atlanta’s version of Rodeo Drive. I was ready to be blown away. Unfortunately I wasn’t. It’s not that the burgers are bad it’s just that they are average. It didn’t leave me wanting to make a trip back to Buckhead to partake again. I always feel when a restaurant as a specific food in their name I should be compelled to drive 45 minutes to have it every chance I get. With that being said the milkshakes were pretty average as well. I felt like I could’ve gotten the cookies and cream milkshake from a CookOut or Steak & Shake location. Nothing to write home about. But don’t let me dampen your parade. You check it out for yourself. Me and My girl, Tanya hanging out. A Burger spot that sells wine has got to be good, right? The final place located in my forgotten files was True Foods Kitchen. This restaurant is located in Lenox Square Mall in Atlanta, GA. This restaurant is dedicated to healthy eating style. They have menu items for vegans, vegetarians and those who eat gluten-free. There is something for everybody. The foods are all locally sourced and prepared fresh daily. I was taken to lunch as a birthday treat by one of my friends and “students” Katrina Parker. I got to sample their sustainable sea bass, the pizza with the house made chicken sausage and for dessert the flourless chocolate cake. I love good food especially when it’s good to you(body). I’d definitely tell a friend, as a matter of fact I’m going to text one right now. Have you ever taken pictures of memorable places and forgotten to share them with others? Or is it just me? Here are three new places for you to go and try out. Let me know in the comments where you have gone and what you think. Until next time, go forward and make memories. I was heading to my first Atlanta Foodies Meetup. I hit traffic not once but twice but I was determined to make it to my first Atlanta Foodies restaurant crawl. I am what’s known in Atlanta as an OTP-er. It means I live outside the perimeter of 285. The city lays ITP, Inside The Perimeter. Generally speaking I live about 45 minutes outside the city of Atlanta. I know if I plan to make it anywhere in the city I need at least an hour and fifteen minutes so I am not late. On this particular day that was not enough time. I ended up spending about two hours trying to make it to my Atlanta Foodies meetup. I made it, late and a little frazzled but I made it. I do not let where I live affect me meeting new people and trying out new restaurants to share with you guys. I finally arrived at Tupelo Honey Cafe . Our group organizer, Audrica of Napping on Mondays, was so gracious in helping me not feel bad about being late. I quickly got a seat and was introduced to the small group of attendees. I was a little late so food had already been brought to the table. What a spread it was. I think the pictures will do better than the words I could ever type. Between our waitress and the manager, we were made to feel like we would never want to leave and truly we didn’t want to. But there were more restaurants to visit and good eats wait for no one. Make sure you check them out in the Gateway Plaza in Sandy Springs. The Peach Bell, a must have cocktail made with moonshine. Need I say more? The second stop on our restaurant crawl was Urban Cookhouse. All I can say is that I didn’t know I liked broccoli salad until UC. It was sweet and crunchy and just downright yummy. UC is a family friendly restaurant. It even has a drive thru for those days when you just can’t manage to get out of the car or don’t want to fuss with the kids inside a restaurant. The must have item on the menu is the Half Baked Cookie……MY GAWD! Seriously it’s not something you want to share with anyone else. So make sure everyone gets their own. Check them out the next time you’re in Sandy Springs. Our finally stop on this restaurant crawl was Buttermilk Sky. 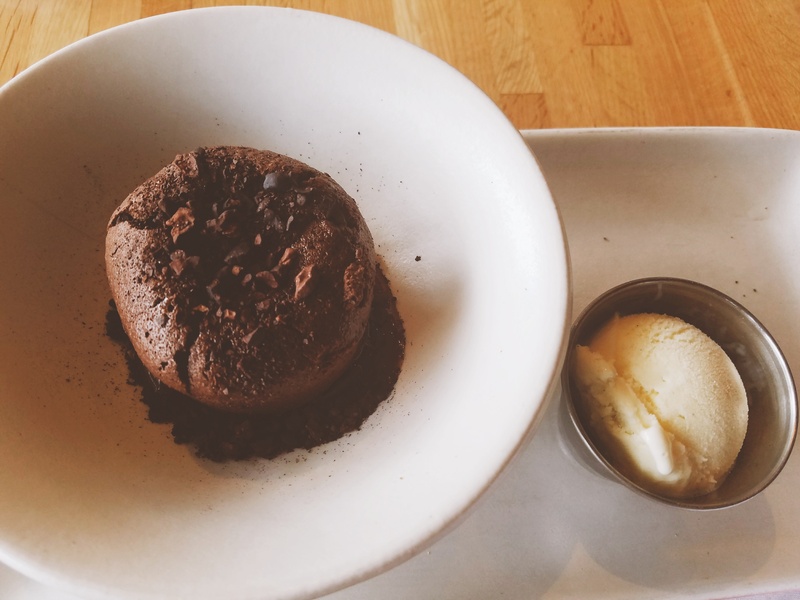 Now technically we had dessert over at Urban Cookhouse but…Who can say no to pie? I sure couldn’t, so off to Buttermilk Sky we walked. At this point in the crawl the ethnic fatigue was starting to kick in. I knew I would still need to make it back to Conyers, you know OTP almost an hour away. I still pushed forward because my readers need to know what the Gateway Plaza in Sandy Springs has to offer them. I did it for you : )…LOL! Buttermilk Sky is a quaint little bakery that offers what I came to realize was some damned good pie. Kimmie ,the owner, took time out to chat with us about her bakery and what it offers. (Check out my Facebook page for the videos) She then presented us with goodie bags with what else? … PIE. We got to take home her I-40 pie, which has fresh grated coconut, pecans and chocolate. Now anyone that knows me knows that I am not a fan of coconut but that pie was really good. We also got the All-American favorite…apple pie. I sampled it cold and then reheated it the next morning for breakfast (I know it wasn’t the healthiest breakfast but it sure did taste good. The green tea helped to balance it out some…LOL). The crust on the pies were so buttery and flaky. And the fillings weren’t too sweet. They seemed almost perfect. I can’t wait to go back. Make sure to give Kimmie a visit and let her know you read about her on The Chef In Pearls. I look forward to the next Atlanta Foodies Meetup. 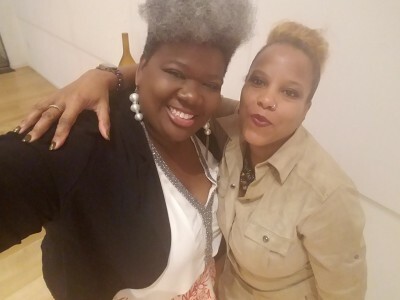 I got to meet some wonderful new bloggers including Shana of Technotini, Loren of Dating with Passports, Sharonda of Pay or Wait and our organizer Audrica of Napping on Mondays. I can’t wait to make more memories with Atlanta Foodies Meetup. Now you have 3 new restaurants to check out. Go forward and make new memories. Until next time.